Glenn writes mostly for HubPages with over 1.5 million views. However, he has an interest in examining other sites for research purposes. The business models used by many writing sites have lead to failure. I offer my opinion on three of them based on my background as a systems analyst. Bubblews was a site for people who wanted to write about anything with a minimum of words. It was founded by Arvind Dixit and paid a penny for each view. Short posts usually don't get organic traffic since search engines don't see any value in it. Even those who wrote more involved articles couldn't reap the rewards of their efforts because the entire site had a low ranking. Spamming and low quality posts were a big part of the problem. They attracted people who couldn’t write a complete English sentence. A lot of spammers gamed the system and they didn't do anything about it. Other problems included server outages and system crashes, not to mention poor programming of the platform. When things went wrong, they made quick fixes without testing. That caused more bugs. In July of 2014 a system upgrade produced a disastrous bug. All of a sudden anyone who had more than one image in a post had lost all the text after the second image. Many of us frantically edited our posts to put back the lost text. What did management do? They considered the sudden rush by everyone editing to be a problem, so they removed the ability to edit posts. We were screwed. Google eventually dropped those posts from the SERPs due to empty content. As a systems manager myself, having worked in two major corporations, I never allowed implementing programming changes without testing. Every time Bubblews tried to fix one thing, they broke something else. Good programmers test their code thoroughly, and managers check to be sure it’s working. I’d rather write on a site that functions on a professional level. It’s hard to find anything else that matches the integrity and professionalism of HubPages. With all these problems, it was obvious that Bubblews was headed to failure. In November 2014, Bubblews announced that they are reneging on paying residuals on redemptions made prior to that date. At that point I immediately deleted all my articles. I had backups saved on my computer since I write everything offline. Many other diligent users deleted their content too. The pending demise of Bubblews became clear on December 18th, 2014 when Arvind Dixit posted “Bubblews has distributed over $1 million to date, considerably more than our revenues.” This clearly meant that they were out of money. The site remained for another year without paying anyone. I never could understand why so many people continued to write without getting paid. In November 2015 Bubblews shut down without warning. Shortly before that, they changed their policy stating that anything posted on their site is their property and they retain the rights to use as they see fit. Many people didn't pay attention to that new policy, but I stopped writing and removed my content in time. A lawyer told me that if we continue to post new content after they changed the rules then we are showing agreement to those changes and have given away our rights. It was obvious that they never had a clear business plan and they were just winging it as they were going. As a businessperson myself, I could see right through that. Bubblews had a payment model whereby they committed to paying earnings before they even know what amounts they will be collecting. I think this is a business model destined for failure. They created their own algorithms whereby they pay per view, per comment, or other user actions. At some point Bubblews discovered that certain countries did not bring in any revenue, so they refused to pay those users the amount that was already posted as their pending revenue. Then it got worse. I can’t forget how Arvind Dixit once stated that due to a “ridiculous amount of fraud” they would not pay anyone at all. Those of us who followed all the rules were put in the same class as the spammers. Did Bubblews Steal Rights to Our Content? In my opinion, if you deleted your posts before the policy change I mentioned above, then you still have rights to your work since you posted in good faith under the prior terms of service. In addition, as long as you stopped posting new content after the policy change, you are still under the old rules that gave you rights to your content. Many things they have done were fraudulent and many of us have records on file with the Better Business Office about the fraud and payments still due to us. So I doubt they can even sue for rights to content that had been left on the site when they closed down. Persona Paper is a writing platform for sharing thoughts, experiences and knowledge. However, the first problem I saw was that many people wrote about their daily lives. One writer posted about waking up, having breakfast and walking the dog. What’s the point of sharing that? I’m surprised to see people were following her. Google finds no use for that and it hurts the ranking of the entire site. Persona Paper was started on March 1, 2014 by Ashley (&Ashley). However, after a career change that involved a lot of traveling, Ashley turned it over to Heather Lee Chapman (&MaeLou) and William Chapman (&elitecodex) to manage the business from their home in Port Charlotte, Florida. They ran it as a Sole Proprietorship. Unfortunately, they did something that caused their AdSense account to be canceled. This doomed them from the start. As an alternative they began using other ad agencies, but some of those ads were dangerous links to malware sites. The red flags began to unfold. One can appreciate the value behind the following concepts. They were designed so that Persona Paper would never be plagued with spam or with fraudulent activity. They paid in virtual coins that were presently worth $0.0015 per coin. The value of the coins was based on an exchange rate that was adjusted in relation to the ad revenue. Users could either cash out once they reached $20 worth of coins or they could leave it in their virtual bank and let it grow. Two coins were earned for each unique view and one coin for each comment on other people’s posts. Nothing is earned for likes or comments received from others. I find this to be a unique concept that is designed to avoid hackers and spammers from gaming the system. Payments for commenting motivated people to engage with the author of articles. Comments needed to be well written with at least 30 characters, not just “Nice Post”. Plagiarism was not tolerated and was closely monitored. Accounts were deleted if duplicate content was found. They also carefully enforced the proper crediting of images used from other sites. When posting, one needed to complete an "image credit" section. Even our own images had to be credited—to ourselves. Despite the good business ideas that they had, which I just described, Heather (&MaeLou) and her husband Will (&elitecodex) didn't handle the system well. Will was a programmer and the only one maintaining the site. I had reported a number of problems to him. The worst was malicious code used by one of their ad agencies that redirected Apple mobile users to their own product site by using a known browser exploit. When I told Will about this, he said they needed to keep that agency because they paid a very high ad revenue. He obviously didn't care to provide a reader friendly experience. In August of 2015 both Heather and Will were nowhere to be found. For a couple of months, no one could get a response to queries or for help. Finally on September 5th, 2015, Heather posted a message stating that they both became very busy with their personal lives. Gee, I thought this was a business! Will also left a post saying they are discussing their options about how they will be moving forward. It was at that time that I knew they wouldn't be around much longer and I stopped writing articles. On September 7th, Will posted a detailed explanation of the present state of affairs. Both he and his wife had full time jobs and didn’t have the time to commit to Persona Paper any longer. Will also explained that they gave out more coins than they have the money to pay out. The same thing happened with Bubblews and we all know how that turned out. Ask for volunteers to assist with day-to-day operations of the site. As of February 2016, Persona Paper announced that they are shutting down—just as I had predicted. It was so obvious. They never followed up to fix bugs. They warned everyone five months earlier that they ran out of money. It was only a matter of time. Unlike Bubblews, they at least had the courtesy to leave the site online so people can copy and save their articles. A year later, in March 2017, Meg Learner purchased Persona Paper to take over the entire business—software and domain name. Even though she says writers will not be paid any revenue, she invites people to publish new articles. There is no advertising, but there are errors for ad placement throughout the site for unregistered ad agencies. I guess she doesn't know how to remove that code. No one is being paid. Meg makes that clear in her posts. However, she doesn't know how to change the FAQ and TOS pages that still say people get paid for content. As of July 2018, Meg is still keeping the site alive, but under the above conditions. She needs to hire a programmer who can manage the software, but I realize she has no money coming in for the business so that's not to be expected. Meg says that she has a couple of advertisers in mind but that traffic is not sufficient yet to bring in advertising. I don't think she realizes the little chance for that based on the present site architecture. It's a content farm, and Google frowns upon that. All the articles are under one domain, and Google ranks that very low. Sites need to have a specific focus to attract organic traffic. That's why HubPages has over 20 sites in their network, which is a proven business model. With all the latest algorithm changes by Google to only give good ranking to content that provides value to the reader, and the fact that the prior owners of Persona Paper had been banned from using Google AdSense, the task of turning Persona Paper into a profitable business is not going to be easy. Niume has always said it's a social network collaborative site. That implies that search traffic is not the focus. I looked at Niume's XML sitemap and discovered that they never included author's posts. That's the file that shows search engines what pages to index. It’s sad that they never had a good business strategy, or maybe they just didn’t understand how to do it. They required building traffic via social media rather than search engines. I'm a system analyst. When I first investigated how Niume's platform was constructed, I knew their days were numbered and I predicted their demise as I did with the others that are gone. On May 26th, 2017, Niume posted in their official blog that they would no longer pay revenue for posts. On October 2nd, 2017, all content on Niume was deleted and the site was shut down. When a writing site displays ongoing problems, it's important to consider if time spent writing on that platform is worth it. It's also important to observe how strongly management is willing to keep up with the latest trends with search engines and the Internet in general. HubPages is constantly revising their methods to match the requirements of Google and other search engines. 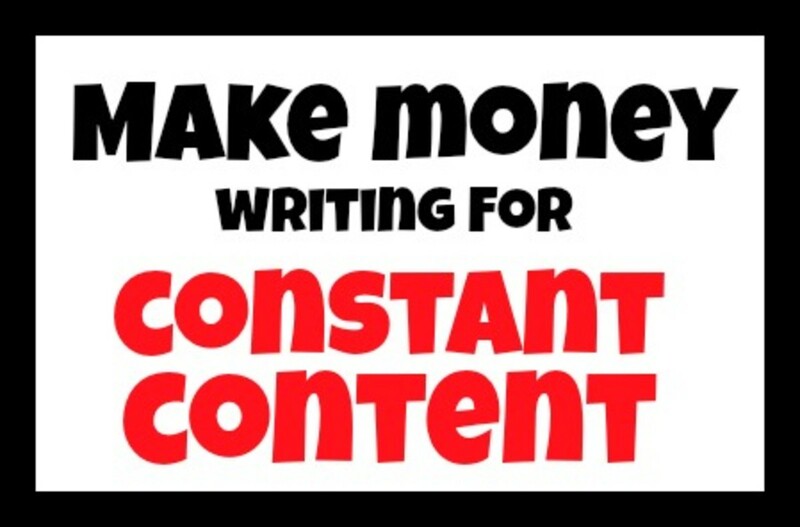 That is what's so important in order to remain profitable for both the writers and the owners of the business. All the sites that have gone out of business had focused on accumulating posts that people wrote about any miscellaneous subject to their hearts content. That didn't serve any purpose, and it offered nothing that Google can use to provide answers to people's search queries. A site needs to specialize in one subject and provide information written by people who have a demonstrated knowledge of the subject. It doesn't matter if they are specialists or simply experienced by being involved with the subject. Nevertheless, even specialists will fail if they share their articles on a site among unrelated content. 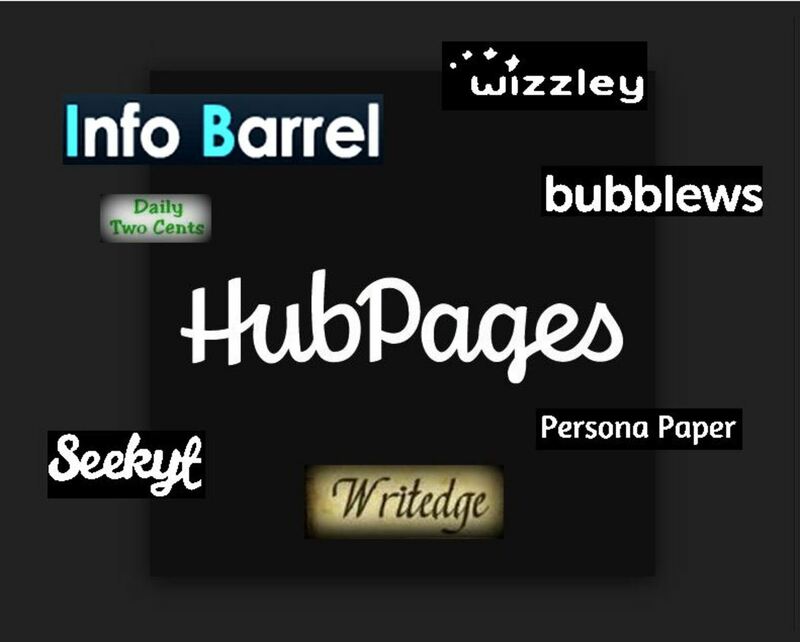 This is why HubPages is doing so well—they organized our content among individual vertical niche sites. That's why I'm glad to be writing on HubPages. Logos and trademarks displayed under "fair use". Are you seeing any new sites out there similar to Niume or Bubblews? I know the formula is flawed, but I have fun writing on them while they last as I make a little money and meet other writers. If you only want to write on sites similar to those, you're wasting your time. You won't make any reasonable money for your effort. They don't make money either, which is why they all eventually go out of business. On the other hand, if you are serious about writing quality articles that serve a purpose and provide useful content that people are searching for, then I recommend HubPages.com. If your articles are good, they will be curated and placed on niche sites where they get better search engine ranking and better traffic. 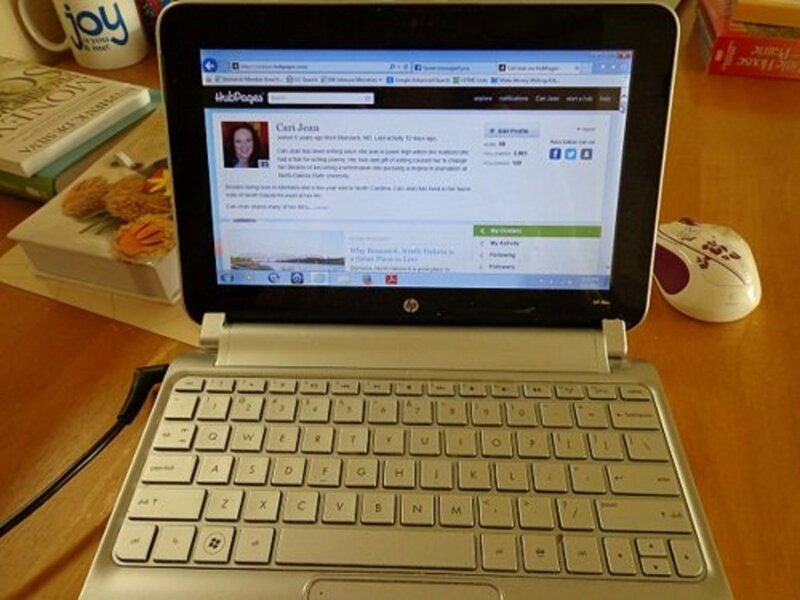 HubPages also has a community forum where you can collaborate with other writers. Virginia Allain - You’re right, keeping a backup is important. I write all my articles off-line anyway. I use MS Word, then I upload (or copy and paste) to the site when I’m ready to publish. So I always have a backup on my computer. It's vital for writers trying out sites like these to save each and every post at the time it is written. I use Evernote for that. If a site fails, then you have your work saved for reuse later in blog posts or elsewhere. This article that I wrote about the demise of Bubblews, Persona Paper and Niume has been chosen by the curators for the ToughNickel niche site in August 2018. The information is pertinent with the latest events, and I keep it up to date. I was on all the three sites you mentioned. Bubblews paid me for a year but no payment from niume or persona paper. I don't think it will last long. It's not a writer's site, it's a chat site where you can make short-term money by posting stuff you can't use elsewhere. Marisa, I took a look at Steemit. I see a lot of poor English grammar in the instructions and Q&A. That's not a good reflection on the staff who's running the site. In addition, payments are made in virtual currency. I wouldn't trust it. Never heard of it Marisa. But I'll look into it. However, if it combines miscellaneous topics under a single content farm, then it probably will have the same SEO problems as the others. Would you agree? I enjoyed Niume's format and display and was sorry to hear it was shutting down. I saw the handwriting on the wall and saved all my work weeks ago. I am through with joining third-party sites. Very few last longer than a year or two for the reasons you mentioned. Although Persona Paper is no longer monetized, we are allowed an affiliate or promotional link now in our posts. I truly hope Meg succeeds in bringing it back. My work is saved, just in case she changes her mind, but most is simply not transferable to any of my own sites, just as many Niume posts aren't. Many are too short and the subjects don't fit any of my blog topics. In case people haven't heard, Niume is shutting down Oct. 2. Rescue your posts, if you have any there. They did not send an email, just a post on the Niume blog. Marisa, Thanks for your input about this article. You are absolutely right about the fact that any site today that attempts to throw a lot of miscellaneous articles under one domain will be doomed for failure. That's definitely in addition to the issues I presented, and is most important. As you said, a site needs to present an image of expertise in a single subject. I realize I need to include that Google no longer wants "Content Farms" for that reason. You are also correct about the date this was originally published, which was over two years ago. However, I have been updating it as things have changed, as well as adding more information (such as the issues with Niume). Nevertheless, I thank you for bringing to my attention the most important issue that I left out. I'm glad to be writing on HubPages for that very reason you mentioned. The division of our articles among niche sites has been a lifesaver. I suspect this Hub was started when these sites were genuine alternatives, then morphed as they went wrong. I wonder if it's time for a proper edit? It makes me sad when I see new writing sites popping up, usually started by refugees from one of the other failed writing sites. I'd like to think a Hub like this could serve as a warning to them and to writers who consider joining them. Yes, poor management contributes to the demise of these sites - but focussing on that diverts attention from the core issue. The fundamental business model is the real problem. It doesn't matter how genuine a new site is, if they're not specialising in one particular subject, they're doomed to failure. There is simply no future for article-writing sites that don't specialize in a particular subject area (unless it can get classified as a News site). Google wants specialists and as HubPages has discovered, it's not enough for individual writers to have expertise on a site - you need the whole site to present an image of expertise in one subject area. That's why HubPages has had the good sense to create the niche sites. I liked the earnings I had from Bubblews, but wasn't surprised by its inability to maintain the pace. Having been on eHow and Helium and Squidoo, I'm used to having sites pull the rug out from under me. At least eHow offered their writers a buyout, and I know a few writers who put a significant lump sum into their children's college funds from it. I'm still puttering a bit with Niume as I like the look of the posts and the freedom to write short pieces on random topics. Slowly, I'm removing some posts from Niume, and combining them to make hubs. Thanks Audrey. I made that website to make it easy to find my articles based on subject matter. HubPages has a topic filter on our profile page, but most readers never notice that it's available. This is exactly what I'm doing starting now! Just checked out your website and saved to my "favorites". I plan on reading every article! You and I have been on HubPages about the same length of time Audrey. I never write anything online. I always create all my articles offline and then upload when done. So I always have a backup. I failed to see "the writing on the wall" with Bubblews and lost my articles. But thanks to you Glenn I have saved my posts on Niume and am deleting each one. I just celebrated my 7th year here on HubPages and appreciate the integrity here. Thanks for keeping us "on the straight and narrow". RoadMonkey - I saw that MegL posted a couple of articles, but nothing about her future plans with PersonaPaper on the front page where system status information goes. However, I did find a comment she made in someone else's article saying that she is taking over, that they will not be paying out just yet, and that she may have her daughter try to figure out how to post to the front page. I checked the "whois" info on the domain and I see it was transferred on 2016-08-31 but she now needs to renew the domain registration before it expires March 1st. RoadMonkey - Yes, I found that she commented on someone else's post. But she never posted anything herself so most people won't even know she is alive. If she is active on Facebook, that doesn't help much when people are looking for activity on Personal Paper itself. 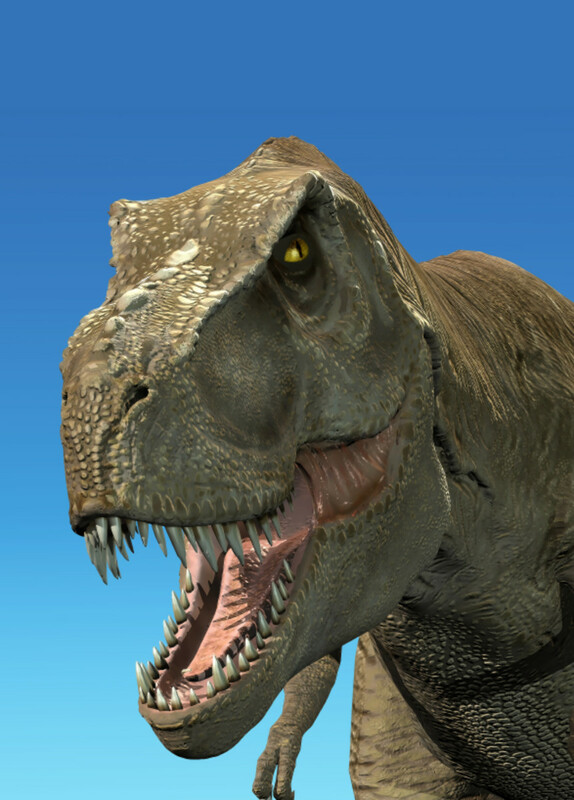 As for the domain, webmasters usually prepay for many years in advance. They don't let it run close to the expiration date because Google takes that Into account for ranking the site. Look at HubPages for example, their domain is paid up until 2020-04-28. MegL has taken on PersonaPaper. Why would anyone need to renew the domain name 4 months ahead of time? I have seen a post from her in the last few weeks. I haven't seen a management post but there is a Facebook group. jlherrera - I have not logged on to PersonaPaper for a long time, but I just checked it out today because of your question. Many months ago they announced they will be shutting down and the bank page had a statement that they discontinued the payout program. This meant that people could still post, but they would not be paid for their content. In July 2016 it was announced that MegL will take over responsibility for maintaining and keeping the business running, but she herself never posted anything confirming that. As of today I see her last post was October of 2015 (over a year ago). I don't think she has the wherewithal to take it on, especially with the way she was talking a year ago about family problems getting in the way of running Persona Paper. And let's not forget that they lost their Adsense Account. Today, when I logged in, I see they reinstated the bank and I actually have some some money in it. But I don't find any posts from management about any plans. I just see some speculation from other authors, same as you. I checked their domain registration, and I see it expires on 2017-03-01, so they never renewed that yet and time is running out. Persona Paper is still up and the bank amount is still around. Did they reactive? moonlake - I was owed twice that over a year ago when they announced they were not paying pending debts and started over with zero in our bank. That's when I stopped. I saved what I wanted from Bubblews before they went down. I had some money owed. I think they owed me $26.00. I stopped going there when I knew things were getting bad just from what other people were saying. yecall - Going forward, write all your content off line so you save it on your hard drive. That way you'll never lose your articles if a site disappears. At least you got paid. I fell into the black hole a year earlier when Arvind ran out of money and refused to pay anyone who had money pending to be paid at that time. That's when I knew Bubblews would be gone some day. It lasted another year just because people kept writing anyway. Thank you for your article. I was lucky that I got paid at Bubblews. I did not delete my posts though which was stupid and the site has entirely vanished. Ah, well. Lesson learned, keep on top of things. You never know what site is a fly by night. WannaB Writer - I actually checked the view counts on other people's posts on Persona Paper and I see that no one is doing well at all. Each post gets just a few views, and then it stops. You can't even compare to HubPages where traffic keeps coming long after being published. People on PP seem to be happy with struggling to squeeze pennies daily rather than creating a passive income stream that builds on itself. I'm not making much here anymore either. I hope others are doing much better. I'm seriously thinking of taking my work elsewhere. Others have had better earnings on sites they host themselves after moving their hub to those sites. AudreyHowitt - Me too. I rarely check PP since every time I look I see zero Google traffic. Everyone who still writes there struggles to squeeze pennies out of daily posts that only earn a fraction of a penny and then die. The problem is that PP allows silly posts that Google never sends traffic to, such as what one is doing each day. This information may be interesting for a personal friend, but it's not useful to the general public. So the entire site is hurt by it. I see that Persona Paper's mom and pop management seem to have given up on the site since they already announced that they decided to put more attention to their own family lives. And they hadn't been seen for a few months now. They just let the site exist by itself with no interaction. That won't last long. Victoria Lynn - Unfortunately anyone who left their posts on Bubblews before shutdown no longer own the rights. Shortly before the end they changed their policy giving them full rights to all posts. Anyone who left old posts, or posted new ones, would have shown agreement to the changed policy. I deleted everything a year ago when Arvind admitted they didn't have enough money to pay out. Sorry to hear you missed out on your last redemption. I didn't know they had totally shut down. I was $4 away from redemption and kept thinking I might go back and try to get there--but they had made it too difficult. I wish I had taken down some of my articles, but most of them weren't awesome. Still, some of them I liked and would like to have them. Are they just lost? Will we see our work over there show up somewhere? I feel bad for the people who really put hours and hours into the site. suraj punjabi - You did the right thing stopping to write on Bubblews. They were just taking advantage of people who would rather just write without compensation. It's amazing that there are still people posting there now, with little chance of reward. I am one of the many that was disappointed by Bubblews unprofessional behavior. I posted great articles, followed the rules and had my payment reneged. It is really not fair, and I have not posted on Bubblews again since then. This is like the writing site ponzie scheme. Except in this case the person carrying out the Ponzi scheme also looses since they are at a lost due to lack of business planning and management. Things which are too good to be true usually are. Most of what I put on my own sites aren't short posts. My daily blogs are often under 200 words, but many are over 500 words. My other site articles and blogs normally are close to or over 1000 words. I agree that short "what I did today posts" probably won't earn much anywhere. BarbRad - Those short posts don't really attract much organic traffic anyway. I don't think posting on one's own site would help. I was thinking of posting my shorties on my site, but ruled it out. I'm leaving my own site as a list of all my hubs categorized by topic. Of course we have HubPages for our fully detailed articles and they are always working hard at maintaining the business. I'm sad that Persona Paper is headed in the wrong direction. At least all my posts are backed up. I think the only direction right now is hosting one's own writing sites instead of providing content to other sites. I'd better go check MaeLou's post. Peg, The traffic isn't there with Persona Paper because of the business model. The platform does not attract much organic traffic. I think it is mainly due to the type of content. There is too much nonsense such as how people spend their day. This does not offer anything worthwhile. As for the change with not accepting certain countries, it's due to the method of payment (same as Bubblews) which is not a type of payment structure that can survive. They make no money from those countries. So how can they pay out what they don't receive? Notice that HubPages applies payments only when they know they are receiving the residuals. That is the only smart way and it works. I was wondering how you felt about Persona Paper after their recent announcement about non payments to certain countries. This sounded really familiar to the B when they discovered their business model wasn't working. I've enjoyed the few views I had on my articles but the traffic just isn't there. B. Leekley - Yes, I understand how you feel. But since they pay based on user activity rather than actual earnings, they need to filter by country. Those countries that don't offer decent ad revenue can kill their business model. I have been writing and commenting on Persona Paper, too, and have also been favorably impressed so far. I am disappointed that they now allow new members only from the USA, Canada, and Great Britain on the basis of statistics on PP's sources of ad revenue. One of the features I have liked about PP has been the opportunity to read about the lives of people in many different countries, and losing that is a let-down. DzyMsLizzy - I deleted all my posts when they canceled payments. I was able to do it fast by doing it in two browser tabs. Keep your profile page on one tab and right-click each post to open in another tab. Then delete it there and close that tab. You'll still have your profile page with your list of posts in the first tab, so you can quickly go on to delete the next one without navigating back again. Yes--with nearly 300 bubbles, it's going to take me a while to get it all deleted! That's yet another of their annoyances; no way to bulk delete a selection, but must be done one by one by one, with each deletion going through a process of asking you to confirm, then confirming, then returning you to the main feed page instead of your own home page to continue what you were doing! That's a lag of about 15 seconds per article and 4 mouse clicks each! So, nearly 2 hours to accomplish deleting all 300 bubbles! Not something I care to sit and do all at one fell swoop! DzyMsLizzy - You're lucky you at least got some part of that last payment. My redemption fell into the time zone where they admitted they ran out of money and canceled pending payments to those who followed all the rules. I'm amazed that after that people are still writing on the site. I reported it to the BBB and others did too. 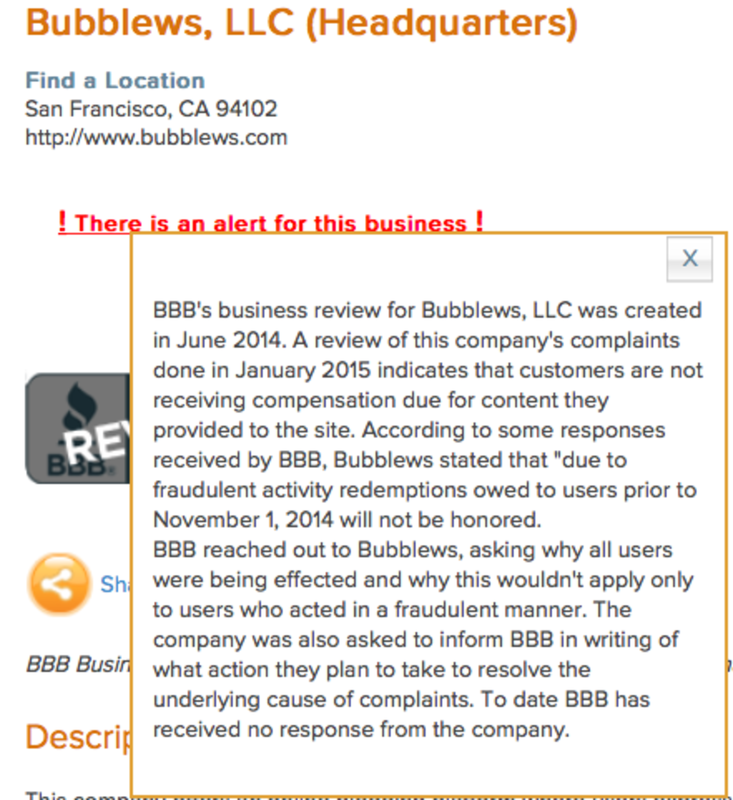 Now the is a negative report on them posted on the BBB's website. Thanks for the vote up. Good to see you here. Indeed! I tried Bubblews for a short while, but I came in just before things went badly south. I did manage to reach a single payout, but even though I applied prior to the Nov. 11th "no payments" cutoff date, it was still a greatly reduced amount from what I had "earned," since they applied the new rate policy retroactively. I've written one or two things since, but sporadically, and I'm not hearing anything good, so I'm fixing to also remove all of my articles and leave the site as well, abandoning any efforts to make another $30 to make it to a second payment, which I have little faith of seeing in any case. PegCole17 - I also felt it was too good to be true at the beginning. And when it became clear that they were just kids who didn't know how to follow up with finances or with system problems, I had a feeling it was just a matter of time. Valuable information here to assist those who are still on the fence about B. I signed up but never wrote the first article after reading a selection of existing ones. It seemed too good to be true and you know what that means. BarbRad - I appreciate tremendously your validation of what I said here. I know there are still many people writing on Bubblews dispite the fact that Arvind posted a statement that they ran out of money. Of cause we can't really believe that either, since most of their promises never came to be. The "magical" upgrade, as they called it, in July, turned out to mutulate our old posts, as you also noticed. Then they took away the edit feature so we couldn't fix them. Then they canceled pending payments after promising to pay if we just waited 60 to 90 days. Now Arvind is saying 2015 will bring betters things. It's a personal choice to keep believing unfulfilled promises? I want to validate all Glenn has said here. I was an enthusiastic supporter of Bubblews from when I joined in February, 2013 until the horrid update in July. At the end of July I discovered Persona Paper, and knew I'd come home. In response to MelanieMurphyMyer, I would say I knew from the beginning that Bubblews was a social blogging site and wrote a post there to that effect and also stated that in the article I wrote here. I have since edited my hub to reflect the latest changes and would no longer recommend the site to anyone not already there. I always hated their clunky editor that wouldn't even let us use italics when discussing books. They talked about the awesome changes to the format that would come in July. I hoped for a decent text editor. Instead, as Glenn stated, they mutilated most of my best posts, which were photo essays. Now they are promising more awesome changes. I'm not excited. I decided to stop writing in mid-December before all the announcements were made. I did not delete my account yet because I don't want to hurt the earnings of my friends still there. I was fortunate that I had already been paid all my redemptions. The last one hit PayPal November 15. I'm quite sure I'll never get the $19 that remains in my bank there. Persona Paper has a great text editor, the ability to post multiple images, and an administration that is financially responsible, keeps its word, and keeps in touch with members. It is all I had hoped Bubblews would be and wasn't. I write on Bubblews as BarbRad, the same name I use here. If you decide to join Glenn, me and other Hubbers who are there, look me up. Persona Paper is a happy place and a welcoming community. MelanieMurphyMyer - This is true. People get themselves into trouble by not being diligent with following up on rules. What I said in my comment was: "that part really isn't Bubblews fault, at least not entirely" - the part where some people were blindsided and outraged because they hadn't read and/or comprehended the TOS. Bubblews could conceivably have pounded the TOS into people's heads on a daily basis and that may have helped, but I still hold that everyone is responsible for their own actions - including people who used a site, accepted money, and didn't pay much attention to the TOS. The real issue here is personal responsibility. MelanieMurphyMyer - Well, if you read the last few posts from Arvind, he actually admitted they lost track of their finances and paid more than they had. So based on that admission, I do blame Bubblews since that is not the way to conduct a real business. But then again, we have to question if that was a lie just to have an excuse for not paying those of us who followed the rules. Right. 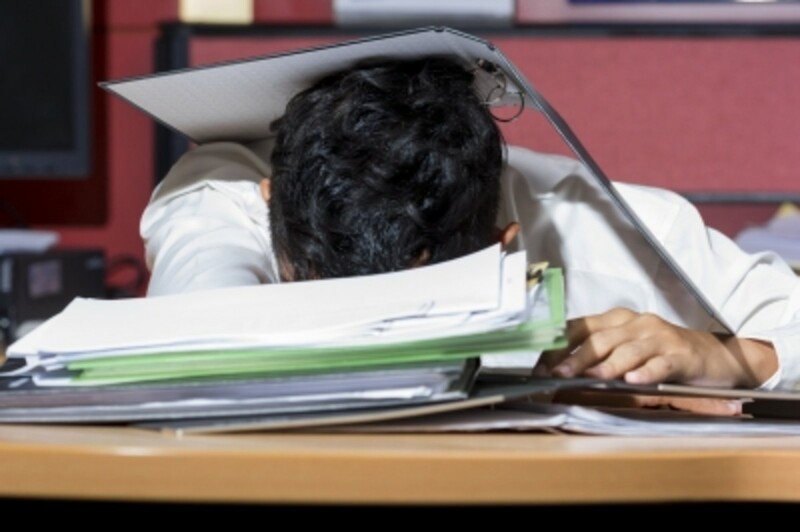 There were a lot of professional writers who mistakenly thought it was designed to be a freelance or article-writing site, rather than a form of social media. Also, those of us who read the TOS and took them seriously knew from the start that there was no guarantee of receiving money consistently (or at all) and that it was all a gamble in that respect. I feel bad for those who didn't know this and thus were not prepared, but that part really isn't Bubblews fault, at least not entirely. MelanieMurphyMyer - That may be so, but they are also losing a lot of good writers who realize it's not a professionally run venue. And they are also losing the honest writers who did NOT game the system, but whom Arvind decided not to pay because he ran out of money, as he mentioned in his post. I'm one of them. I followed all the rules. I always got paid within one week. Then suddenly my last redemption of a larger amount was canceled. All I can say is, be careful and keep your eyes open if you want to continue there. Peggy W - Bubblews has always been known to do the wring thing. When they had that bug that lost the text I added it back from my backups. But then they removed the ability to edit because too many of us were editing to correct the mess from their bug. Instead of letting all the rest of you fix all the posts, they just blocked you form it and never brought the edit function back. I wrote on Bubblews for approximately 1 1/2 years and never had a problem until they made that change affecting images...lost text, etc. Not being able to edit was frustrating. I always abided by the rules and losing payments due me is the last straw. I have joined PersonaPaper and tsu recently and will always keep my eyes and ears open as to alternative writing sites. HubPages was my first writing site and I will forever be grateful for what I have learned here. I have also enjoyed getting to know many of the wonderful writers on this site from long term interaction. easylearningweb - You and I think alike. LOL. I also decided not to include a link to my Bubblews profile from my Google+ due to the other low quality posts with poor English, etc. I didn't want Google to lower my ranking because of that. easylearningweb - you definitely should be excited about your accomplishments, and proud of them too. 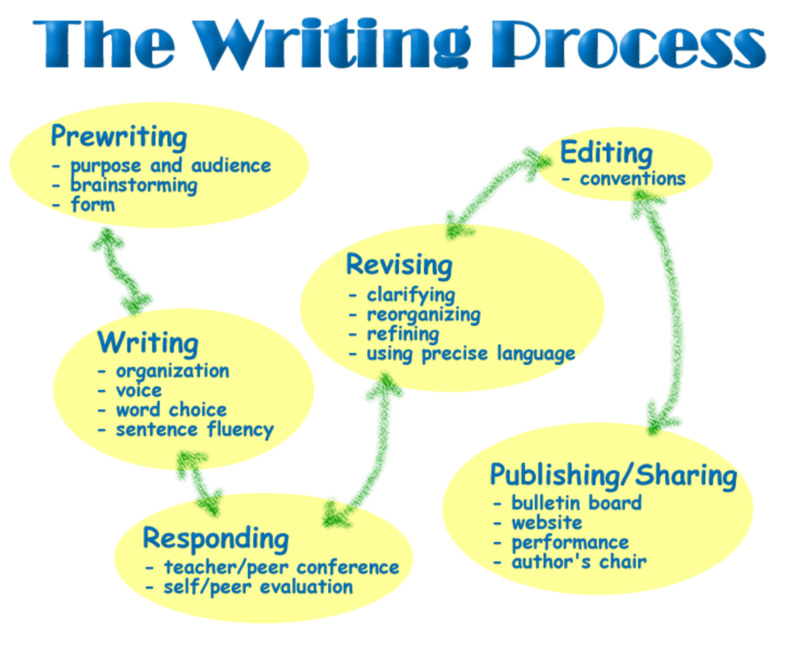 I can see that you are very active as a writer and you are selecting good venues. You were smart to realize quickly how unprofessional Bubblews was. As an IT systems analyst, I noticed the poor programming and total lack of testing that caused many of the problems they had with the platform. I should have stopped earlier too. I give you credit for making a decision to move on quickly. Glenn, This is a good wakeup call hub. I'm not sure why I tried Bubblews which was pretty much a waste for me. I realized right away that the writers were poor but because someone on Hubpages recommended it and said she earned $500 in one day I was curious. I believe the person exaggerated. I only wrote about 7 Bubblew articles and quickly discovered it was not for me. I am planning on removing my Bubblews content. Its not for serious wtiters. I am moving on to bigger and brighter writing pastures. Last year I joined an Aspiring Writers group on Linkedin which offered monthly writing contests. I won 1st place and also 2nd place and my short stories wiil be published in an anthology book this year. I'm very excited. 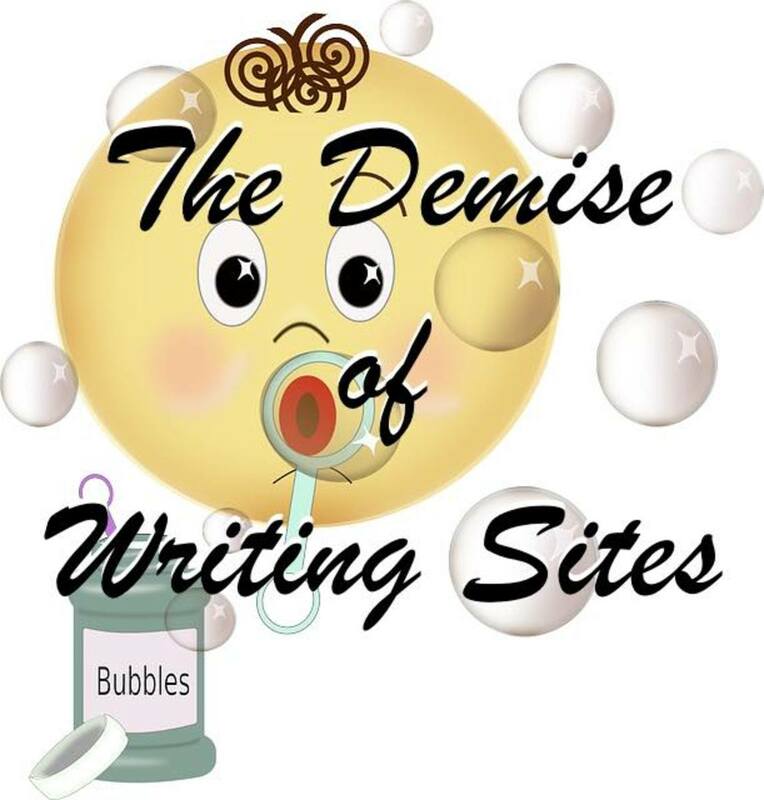 I think we have to look outside the bubble and even outside of hubpages if we want to be serious writers. BTW, I agree that hubpages is a good forum to practice writing. I am almost finished my 30 hubs in 30 days challenge! QuoteAmber - It got worse then Arvind admitted he ran out of money. That's when a lot of people started leaving. But I, for one, was still thinking I'd get my last redemption since I always was paid on time before, and I always followed all the rules. It was the final blow when they announced that they are not going to pay those who followed all the rules just because the fraudulent people helped us. How can one explain that? Really! I jumped ship on Bubblews too. That site just went from bad to worse rather quickly. But I didn't know they'd gotten even worse since I left.